It was hard for me to not talk about the new cymbal line from us this year, but due to the fact we won a Best in Show award from NAMM for an accessory, I feel obligated to feature that item. The Meinl Cymbal Tuners (MCT)were and are all the buzz in the cymbal world. We have had many collaborations with drumming stallion Benny Greb, and this is another knock out. The cymbal tuners are a way to fine tune the sustain of your cymbals, without having to use tape or something else more permanent. Now you can tune each cymbal not only to the room, but to the song as well. Each pack contains 2 pairs of magnets, one thick and one thin pair to make sure you can get the right sound out of your gear. The closer to the edge, the more it muffles the sustain. These also work great on cowbells, and have a very unique harmonic effect on drumheads. Trying to choose just one of the 80+ new items here was another challenge, as it is every year. For those of you who know me, I am a hug fan of tambourines, and have far too many. Well now I have to add at least one more. 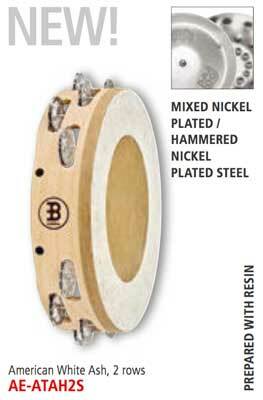 The new Artisan Edition headed nickel plated steel tambourine (AE-ATAH2S) is amazing. With an ash wood ply shell and the combination of these drier, trashier sounding jingles, and the resined calfskin head, it is a sight to be seen as well as a sound to be heard. It has a dry and trashy sound, yet it is not a dark sounding timbre. It will cut through the mix of an style of music, without sticking out. And with this model coming in at a lower price than the older models, it is the perfect model for every school and percussionist out there. Thankfully, this was a lighter year for new items from Nino, with 21. My favorite new item is the Chalkboard Cajon (NINO951DG.) 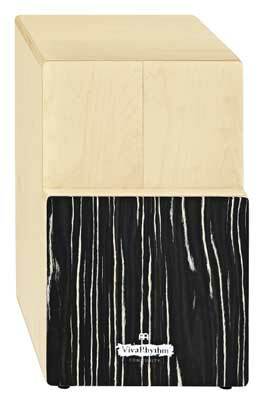 This cajon features a chalkboard finish on the front plate and comes with a package of chalk. 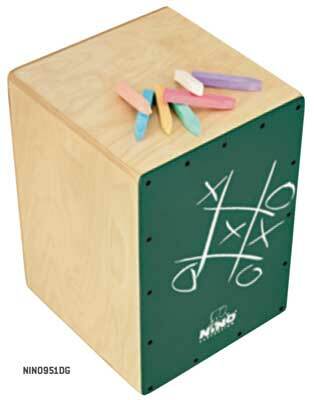 Now you can decorate your cajon for each gig, or write out the rhythms you want your kids to play. The sound therapy world is a growing and powerful category. If you haven’t checked any of this stuff out yet, you are missing out on a very relaxing experience. The big new item here is the Harmonic Art Handpan (HD1, HD2, and HD3.) These handpans are hand made in Columbia and finished in Germany to ensure it the highest quality possible. Each tuning is reminiscent of various pentatonic scales, so there are no wrong notes. Each pan comes with a lid, gloves, care instructions, and a deluxe bag, so you can keep your investment protected for years to come. One personal note, with a long history in the steelpan world, I have always been opposed to handpans, they just aren’t the same. But after playing these, my opinion has changed. Viva Rhythm is a new brand for Meinl. These instruments are designed for the recreational player and the drum circle facilitator. Light weight and stackable options for easier transport, without sacrificing sound quality and durability. Picking out a featured item here is another tough one, so I will go with he Tri Tone Cajon (VR-TRICAJ-SO). This cajon features a snare sound, a bongo cajon/tom sound, and a bass tone, thus making your drumset style grooves easier than ever. Having an all birch body and birch & striped onyx front plates this instrument will send out the best sounds possible, with the least amount of effort. So there you go, a teeny tiny splattering of new gear from Meinl for 2017. Make sure you check out all this gear and stock up now, so you can continue putting the best sound you can out there for others and yourself to enjoy.